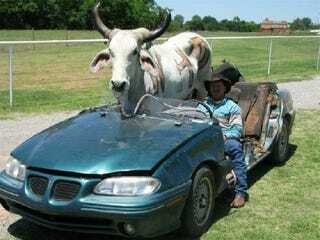 We thought we'd run the story of a man, his bull, and a convertible-ized Grand Am some time in the past; but we can't find it. No matter, it's both funny and unbelievable enough to be verified true by Snopes. Think it's a joke? So did so many people that Snopes decided to investigate and they've declared it's absolutely true. Go figure — truth really is stranger than fiction.